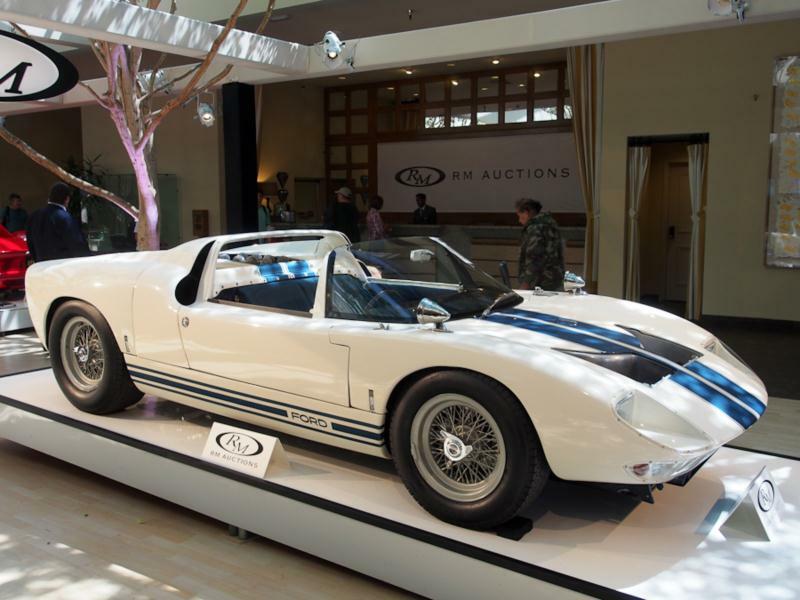 The Ford GT40 stands near, if not at, the pinnacle of collectible postwar American cars. The colorful stories and characters surrounding the model’s development, the GT40’s on-track excellence and execution of mission, and the car’s purity all contribute to its larger-than-life persona. Motivated by Henry Ford II’s unrelenting desire to beat Ferrari on the track, reportedly due to Enzo Ferrari jilting a Ford buy-out offer, led to a partnership with Lola in 1963. The British race car manufacturer had already used a Ford V-8 with some success in their GT, and prototyping resulted in a 4.2-liter, mid-engine, alloy V-8 race coupe sheathed in a fiberglass body, debuting in April of 1964. The sophisticated car could exceed 200 mph and was a sleek 40 inches tall (thus the “40” in the car’s name). The GT40 showed promise on the track, but was ultimately too fragile to reliably compete. Enter Carroll Shelby. Based on the success of the Cobra, Ford handed the reins of the program over to Shelby in 1965. Due to engine shortages, the Cobra’s 4.7-liter V-8 was installed instead of the 4.2-liter unit (signaling the start of the Mk I cars), and the Shelby team won their first race but couldn’t duplicate the success elsewhere. The 1966 campaign, however, was a different story. In 7.0-liter Mk II form, the cars swept the podium (in dramatic and controversial fashion) at the 24 Hours of Le Mans. The GT40 went on to record a slew of accolades at the 24 Hours of Le Mans en route to winning the race four consecutive years from 1966 to 1969. Driven during this time period by the likes of A.J. Foyt, Dan Gurney, Bruce McLaren, and Jacky Ickx, among others, the GT40 became the first four-time winner in Le Mans history, the first and only American constructor to win at Le Mans, and the first specific chassis to win more than one Le Mans. In addition to the Mk I and Mk II cars, seven road-going Mk IIIs were built, with several concessions to practicality. Among other modifications, the Mk IIIs had a larger read to accommodate luggage, a more streetable engine tune, a more forgiving suspension, and some interior alterations that improved comfort. The so-called “J-chassis” cars, which combined an aluminum honeycomb chassis with a kammback body and other aerodynamic modifications, were completed in 1966, and the cars were much lighter than the Mk II race cars and lightning quick as well. Ultimately the car proved to be unstable at speed, with Ken Miles tragically suffering a fatal crash behind the wheel of a J-car during a test run late in the 1966 season. The Mk IV incorporated safety and stability enhancements to the J-chassis car as well as the Mk II’s larger V-8 engine, and a total of six were built by Shelby American in America, as opposed to England. The Mk IV only competed twice, winning both events. Five Mk I roadsters were built, a total of five Mk I and Mk II cars received weight-saving modifications by Alan Mann, and several cars used bored, 4.9-liter versions of the Cobra engine, rounding out the cars 133-unit production history. Today, the Ford GT40’s legacy is undisputable, and its importance to American automotive history cannot be overstated.